Near the steps of the Great Hall of Justice in Washington D.C., a work of art was displayed for all who took part in the 2018 National Missing Children’s Day ceremony. The painting depicts a sorrowful Native American girl holding a single eagle feather. 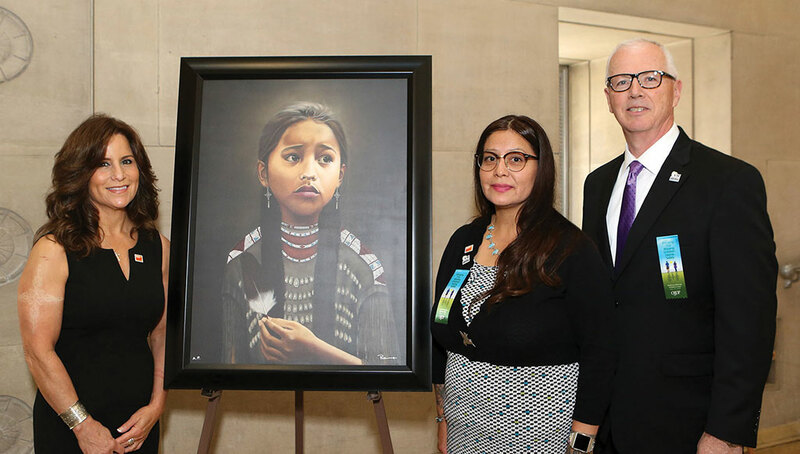 The painting by Santa Fe, New Mexico, artist Kathleen Piccione is titled “Never Forgotten” and is dedicated to the memory of Ashlynne Mike, a Navajo child abducted and murdered at the age of eleven in May of 2016. Before the start of the Missing Children’s Day ceremony, Piccione and Pamela Foster, mother of Ashlynne, met with John Clark, CEO of the National Center for Missing and Exploited Children (NCMEC), presenting him with a framed print of “Never Forgotten.” The portrait will be displayed at NCMEC’s headquarters in memory of Ashlynne and all missing and abducted Native American and Alaskan Native children. Clark recognized Piccione for her generous donation and for the spirit of her work to bring awareness to the tragedy of child abductions in Indian Country. Piccione is originally from Wisconsin and has a family with strong ties to law enforcement and public service. She has also worked with tribal youth and community members for years, using art as a way to teach and heal. Santa Fe Print and Images donated its services for the print to be displayed at NCMEC. Piccione plans to continue collaborating with NCMEC and the AMBER Alert Training and Technical Assistance Program to raise awareness regarding AMBER Alert in Indian Country and hopes her work will inspire others to do the same.